This study focuses on one project-strand developed as part of a university-wide ‘Inclusivity Project’, a strategic plan looking at how changes to the Disability Student Allowance would affect learning, teaching and the student experience. This project-strand was conducted during the academic year of 2017-18 at a creative arts university campus, with a total of four campuses, based in the south of England. It involved research, the design and delivery of initiatives providing practical solutions created specifically for the technical resources team to enhance inclusive practice that would contribute towards the provision of a sustainable response to the Disabled Student Allowance funding cuts’. This study draws upon my personal experience of working as part of a team of Learning Support Co-ordinators within the Library & Student Services department. 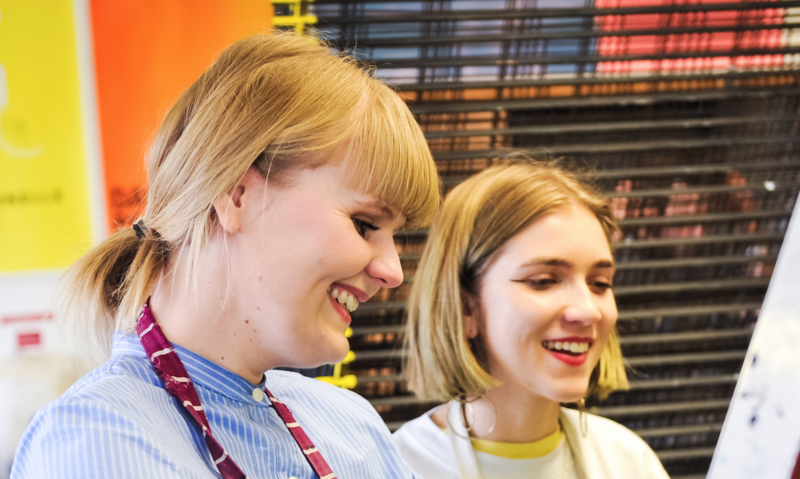 Our purpose was to be ‘change agents’ and take an entrepreneurial approach to supporting course teams by collaborating to positively influence education and students’ learning. In doing so, we aimed to inspire colleagues to reflect on their practice through an inclusive lens. From an impromptu discussion with a Resource Manager and another Learning Support Co-ordinator in a corridor, the opportunity arose to engage the Technical Resources team. When I began this venture I never imagined it would develop into such an influential factor for change in driving the Inclusivity & Diversity agenda for the technical team at a creative arts university. Through my Learning Support experience, I knew the barriers to learning faced by some students were not fully understood or appreciated by all academic and technical staff. The Library & Student Services Staff Development Days were open for all university staff to attend but few (other than Library & Student Services) took up these opportunities to advance their Disability and Specific Learning Differences (SpLD) awareness. This highlighted the lack of understanding that some university staff had about the Learning Support roles. It also emphasised the need for change and a move towards more social responsibility by all staff to provide a fully inclusive learning and teaching experience (Simpson, 2010 cited in Waywell, 2017:21) that would begin to bridge these gaps. I was hopeful and confident that this venture would provide the foundations to begin addressing these needs. This inter-departmental collaboration aimed to provide an innovative approach towards embedding the university-wide Inclusivity & Diversity agenda by working closely with the Resource Manager to enable the development of tailored support and interactive workshop opportunities, and meet the needs of the technical resources team to enhance a more inclusive practice. The Resource Manager planned a Staff Development Day for technical teams for the end of term 1, aiming to run such events at least twice per academic year. Using evidence from Performance Development Reviews with her staff, the Resource Manager had identified their development needs. The Resource Manager envisioned addressing these needs through sessions in the morning, and had organised an Introduction to Peer-Supported Reviews and a Mental Health Awareness session. She had minimal budget and desperately wanted a disability awareness session, so she asked if we could help. We jumped at the chance to take part in this opportunity to collaborate in a meaningful way. The technical team ranged from new enthusiastic staff to those who had been in the job for a long time. This had resulted in a ‘medical model’ mind-set reflecting the perceptions of their role and the culture of staff ‘resisting the changing needs of the student’ (Peck et al., 2010:136). The Resource Manager struggled to engage some of the latter group with Performance Development Reviews/Continuing Professional Development, and was concerned that their disengagement would negatively influence others and lead to a lack of participation. The Equality Challenge Unit report states that ‘an anticipatory approach to reasonable adjustments develops a more inclusive learning and working environment’ (2010:25). By pre-planning sessions through an inclusive lens, staff could potentially reduce their workload. But this was a challenging concept to promote, as to save time in the long run staff must initially invest time to plan for inclusivity. Myself and my fellow Learning Support Co-ordinator welcomed the shift of focus from supporting academics to technicians, an opportunity to bridge the technical and Learning Support staff gap. We combined our skills and knowledge to produce training that would encourage, support and address the technicians’ needs by initiating important learning conversations about student support, and used inclusivity and diversity as influential factors to enhance student experience, improve retention and attainment. We developed an interactive Inclusivity & Diversity workshop to promote and enhance awareness of this agenda, disability related issues, the role of Student Services and practical inclusive strategies. We explained why Inclusivity is important and that ‘removing barriers to disabled learners can remove barriers for all therefore everyone benefits, including employers and wider society’ (DfE, 2017:16). The workshop involved a multi-modal delivery of information, group activities, discussion about challenges they faced, and how they could begin applying practical strategies provided. Activities included contextualising and finding solutions for student case studies, and evaluating and redesigning inclusive handouts (a theme which evolved to be the main focus of the summer Development Day). We used the workshop to find out what other types of support technicians needed, offering Peer-Supported Review opportunities (Learning Support Co-ordinators as reviewers) to continue inclusive practice conversations. I introduced the Learning Support Co-ordinator Mental Health & Wellbeing project-strand lead to the Resource Manager, and suggested that she could provide UCA contextualised Mental Health research and experience for the Mental Health Awareness session. I instigated and designed a supporting ‘Signposting: A list of Current Internal and External Support Routes for UCA staff and Students’ guide to accompany the pre-existing Library & Student Services’ ‘When to Refer’ guide. Both guides were available for technicians attending the Mental Health Awareness and Inclusivity & Diversity workshops. ‘I am glad I could share my experiences with colleagues and keep updated with other challenges that others have faced in their roles’. Unfortunately the Learning Support Co-ordinator I had co-developed this project with had to redirect her energies on other endeavours. I became project lead and invited a Canterbury-based Learning Support Co-ordinator to co-facilitate the March development day workshop. In preparation, I analysed the technicians’ feedback I had gathered from the first workshop, making adjustments to the workshop plan and feedback questionnaire content. Off the back of this initial workshop, the Resource Manager invited me to co-present at the International ETHO Symposium ‘Technicians Diversity and Wellbeing: The role that the technical community plays in supporting a diverse student body’ at Glasgow School of Art in April 2018. I was thrilled, and was able to co-present with a UCA Fine Art technician who had substantial Learning Support experience, and a UCA technical tutor for Moving Image. Both had completed Postgraduate Certificates in Creative Arts Education and had made considerable contributions to the University’s inclusivity agenda. The ETHO symposium at Glasgow School of Art was a fantastic opportunity to disseminate the work at UCA regarding the Inclusivity & Diversity agenda, and show how the UDL principles had provided technicians with an inclusive framework and practical strategies to enhance their practice. It was also an opportunity to gather research from the feedback discussion questions we set, and learn about what other UK and International Higher Education Institutions are doing regarding inclusivity and diversity. We developed a ‘Planning for Inclusivity’ session that consisted of a presentation, facilitating a break-out discussion and a final feedback session. I introduced the reasons why inclusivity is important, followed by the mechanisms being used to support and embed inclusive practice into what technicians do at UCA. I stressed that while the UDL inclusive framework may seem quite obvious, it is a method for encouraging continuous improvement through meaningful and critical reflection and differentiation within planning to create a consistent approach for the design and delivery of technical support. Both UCA technicians gave case study examples of their practice and how UDL principles underpin this. One of the challenges I faced was making the work that I had been doing for the technical team sustainable after the Learning Support Co-ordinator roles finished at the end of July 2018. Based on best practice observed when I visited De Monfort University, I suggested to the Resource Manager that the Fine Art technician could become an Inclusivity Champion for our UCA Farnham campus, someone who would be a positive influence on their team and promote inclusivity through involvement in the development days and Peer Supported Reviews. She agreed and I began mentoring the Fine Art technician, designing together our presentation and break-out session for the symposium at Glasgow School of Art and planning the summer development event presentation and handout focus group workshops. I watched her grow in confidence, putting herself in situations she never would have imagined, encouraging her to take ownership of each experience. She excelled in these and went onto co-ordinate the entire Summer Development Day for Technicians. Although each UCA campus has its own unique diversity (e.g. geographic, types of courses, communities, etc. ), Inclusivity & Diversity is an institution-wide agenda. This project highlighted the importance of providing technical staff at one campus with opportunities to share experiences, challenges and best practice, and a means of gathering information about their specific development needs. Ongoing evaluation of participants’ feedback of their experiences of development opportunities has helped to inform and enable tailored continuing professional development to meet the changing needs of staff. A key recommendation from this project is that tailored development opportunities are made available for all UCA technicians to provide parity for technical teams across all four campuses. Tara J Murphy is a creative arts practitioner, collaborator, educator and Specialist Learning Mentor with twenty years’ teaching experience in FE, including subject leadership, plus eleven years working in HE. She has extensive experience in Learning Support and was recently awarded Senior Fellowship with the Higher Education Academy professionally recognising contributions made towards the development of inclusive practice at the University for the Creative Arts. She will soon relocate back to Northern Ireland where she will continue working in education and is currently researching methods for connecting communities with the creative arts and educational opportunities through the provision of events, discussion and collaborative activities. Department for Education (2017). Inclusive teaching and learning in higher education as a route to excellence. London: DfE. Waywell, H. (2017). A narrative of the role of the learning support assistant (LSA): the impact on identity of working as an LSA in a creative arts university. The Journal of Inclusive Practice in Further and Higher Education, Issue 8 pp.20-29.